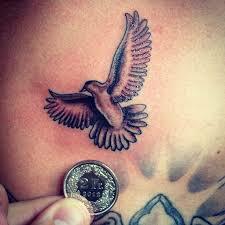 If you are looking for a tattoo that is not only amazing but inspirational as well then you must get the dove tattoo. These tattoos are often a beautiful expression of faith and you won’t find a more creative tattoo. 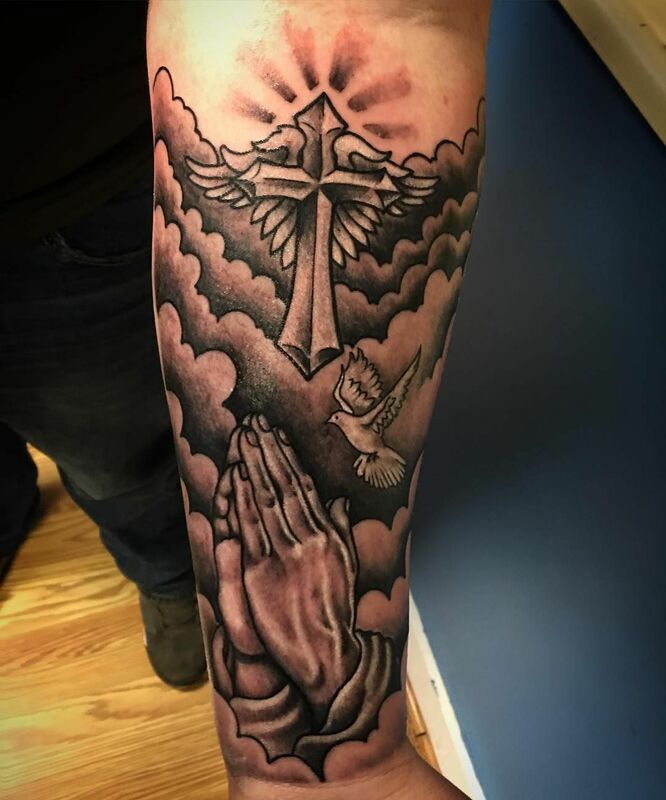 Aside from faith, it also hosts a multitude of meanings for each and every individual which makes it the perfect tattoo design for anyone, male, or female! 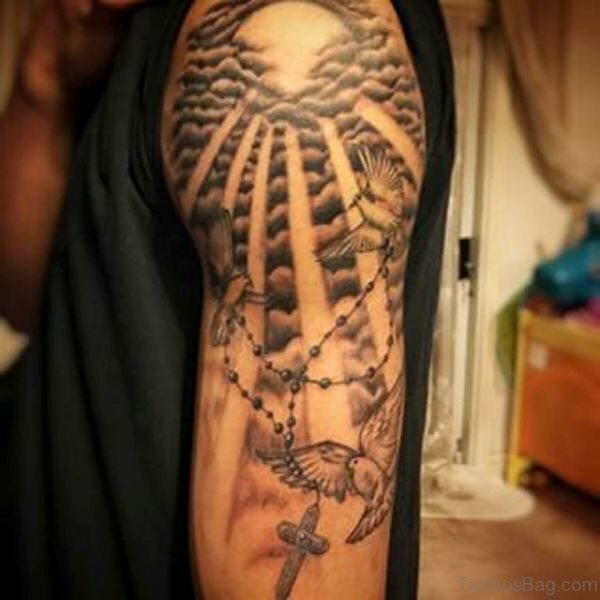 In this article, we will share with you an amazing and awe-inspiring gallery of dove tattoo designs that you will most definitely enjoy looking. In addition to this, we will also be discussing a brief background on dove tattoos like the meaning behind such a tattoo and the preferences of both men and women for the said design. 1 What Is The Meaning Of A Dove Tattoo? 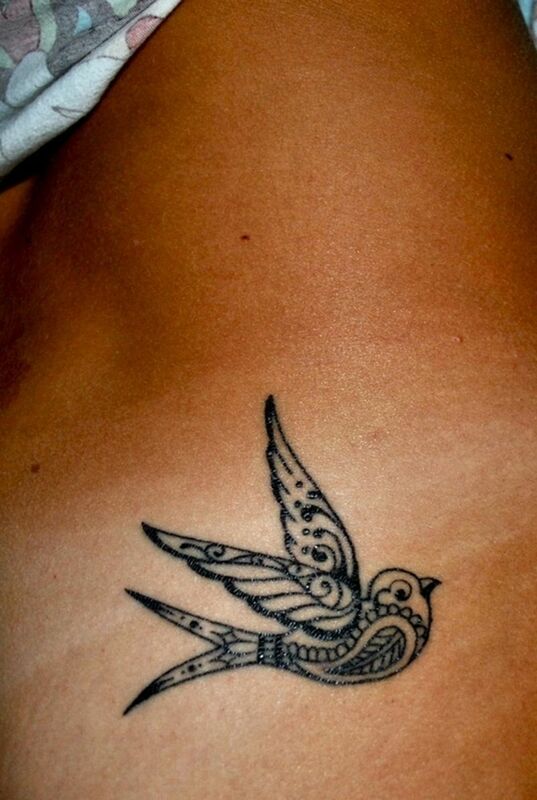 What Is The Meaning Of A Dove Tattoo? 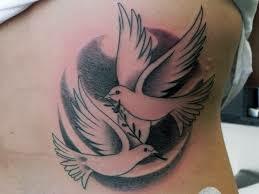 Dove tattoos also symbolize endless love. The dove symbols have long been romanticized way back the days even before our great grandparents. The reason is simply because of the dove’s unique characteristics. Once a dove finds its mate, they will live together until their dying breath (They are one of the few animals that exhibit monogamy alongside penguins). Usually, when the other dove dies, the remaining dove will never find any other mate again and will normally die in the following days because of depression and loneliness. When compared to humans, this shows the strong bond and affection a couple has for each other. 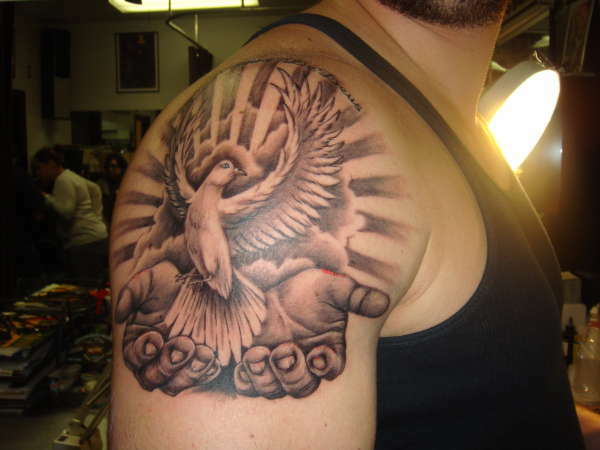 Various tattoo designs can be done with the dove tattoo. 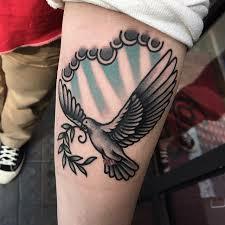 From the very simple and traditional one to the more complex and bigger than life designs that will blow anyone’s mind away, there are a lot of dove tattoo designs out there that can suit your own needs when it comes to your pref=ference. Realistic dove tattoo designs have got to be one of the most complex designs out there that features a bird as its main object. Since most of these tattoo design features a “painting like” detail to them, they are considered a very detailed and complicated tattoo design overall that would take countless hours to design and ink onto the skin. Regardless of this, we personally think that you will absolutely love this tattoo design and consider the time, pain, and effort to be extremely worth it! 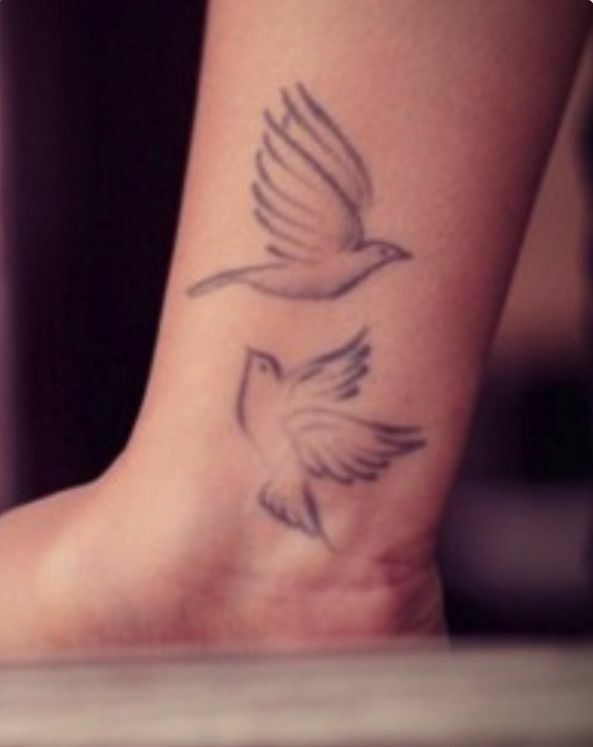 Here are some of the best dove tattoo designs we saw on the internet that you will absolutely love! 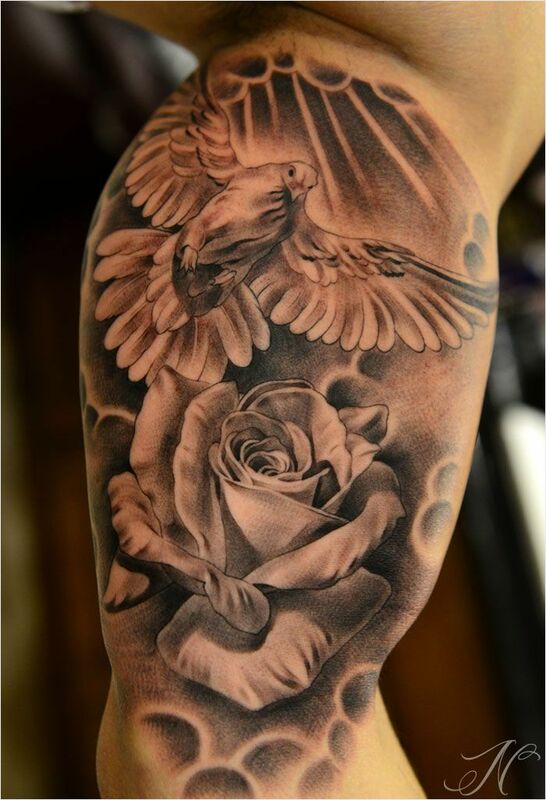 A realistically detailed dove tattoo and a rose. 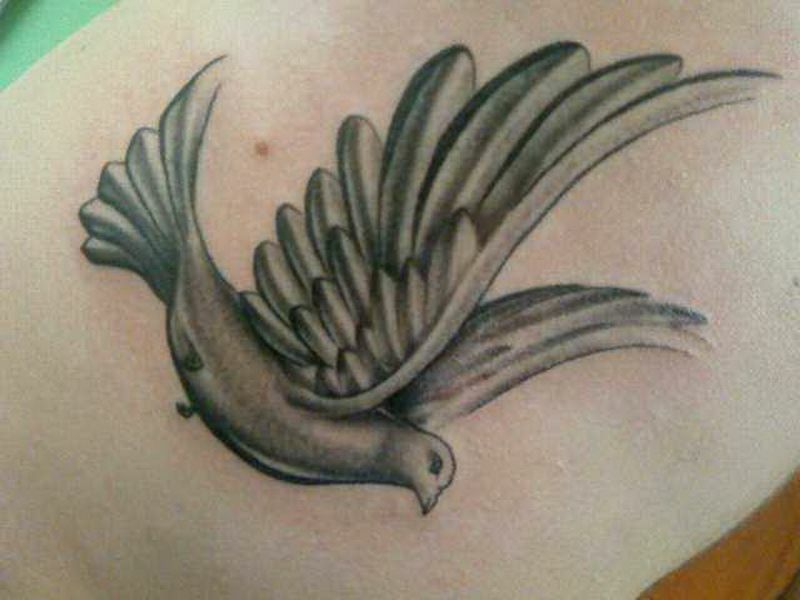 A realistic dove tattoo on a a sunny background. 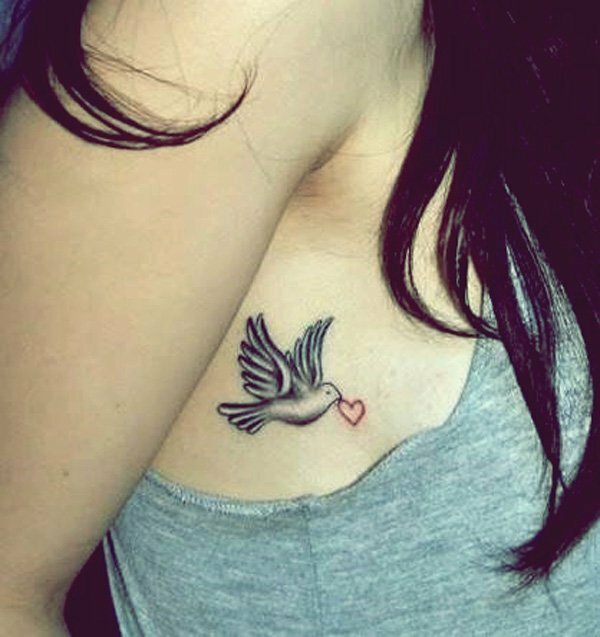 A shoulder tattoo of a dove. 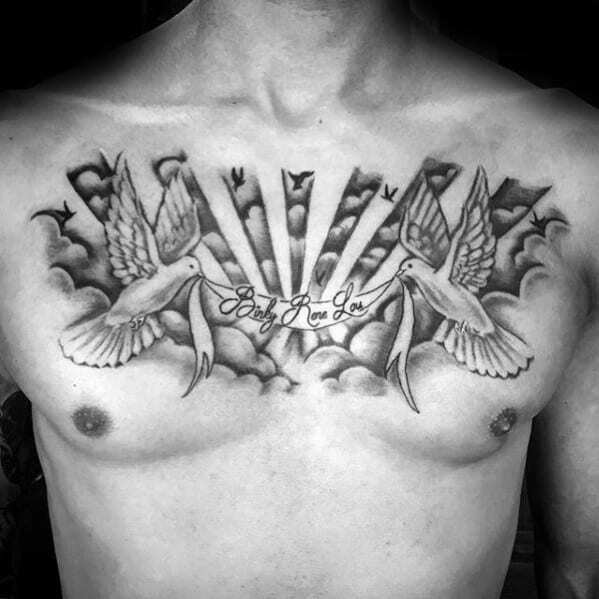 A large chest tattoo of a realistic dove. A sleeve tattoo of a dove in a stormy background. 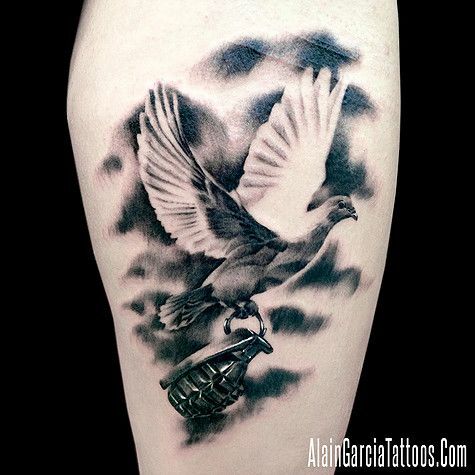 A realistic tattoo of a dove holding a grenade. 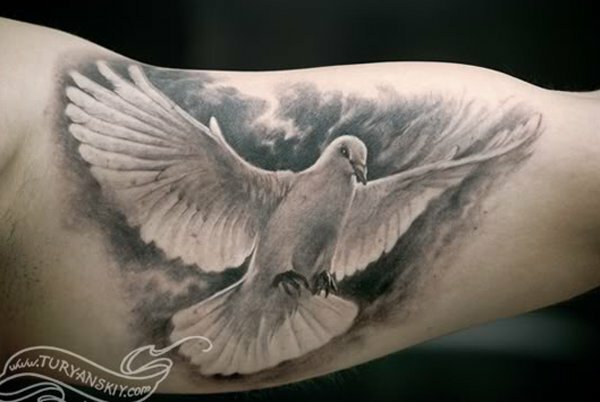 A realistic forearm tattoo of a dove. 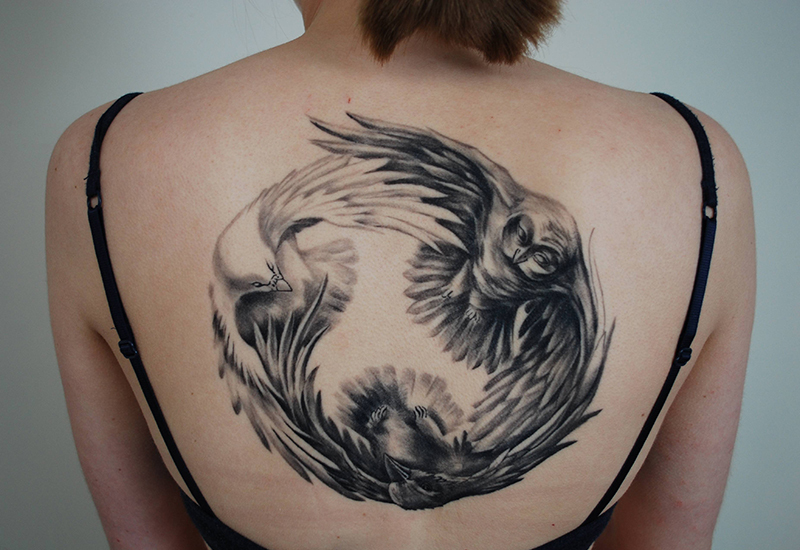 A large back tattoo of a realistic dove. 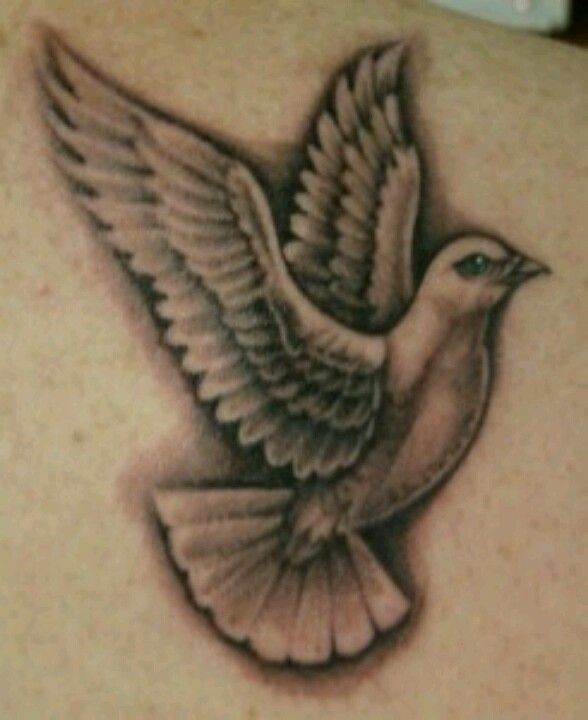 a realistically detailed tattoo of a dove. 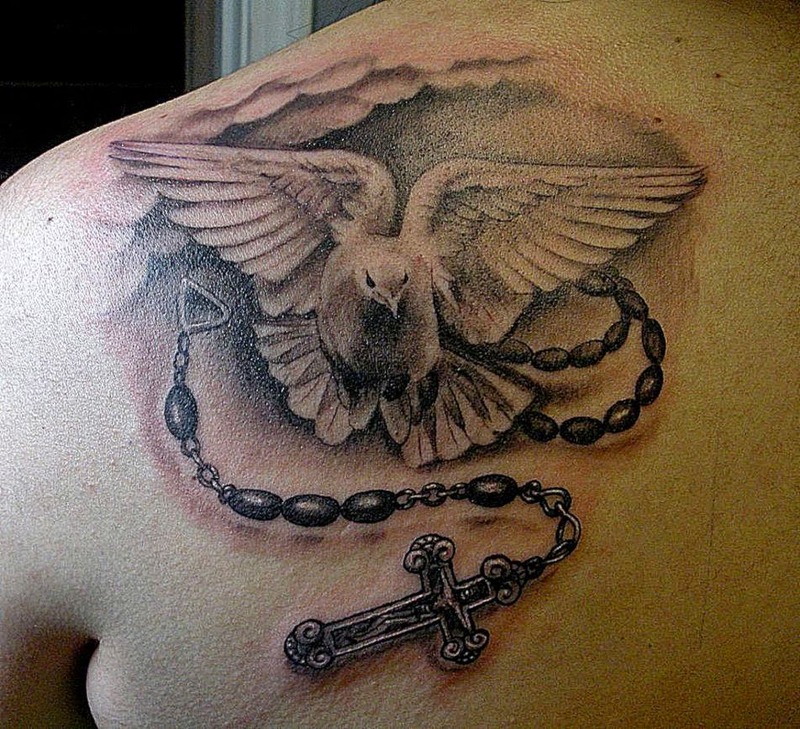 A realistic tattoo of a dove holding a rosary. 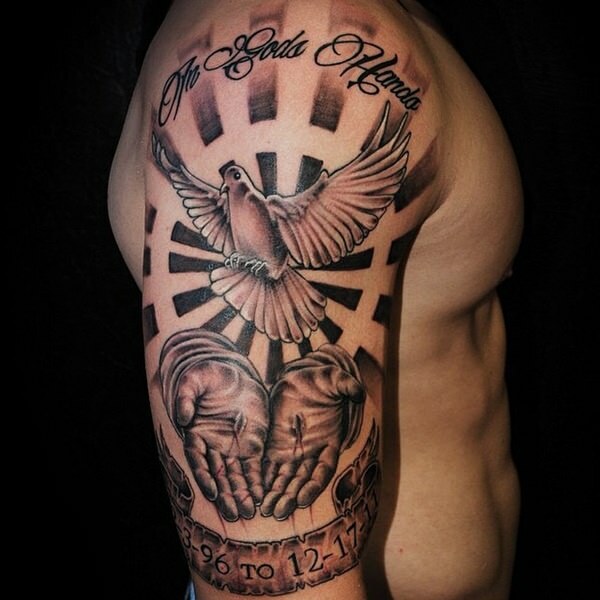 This tattoo design carries a religious meaning to many people alongside the cross tattoo. 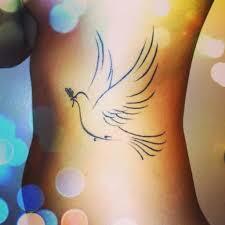 An ascending dove is like a spirit going to heaven. For Catholics, the ascending dove is often linked with the Holy Spirit, the third part of the Holy Trinity. However, you should also know that not only devout people can have this tattoo design inked onto their skins. With the addition of the clouds, this tattoo can also symbolize the beginning of a person’s journey to follow his or her dreams. When you have something to aspire for, you naturally want to move forward and keep reaching for it until you turn that aspiration into a reality. That is what this tattoo design also want to convey. 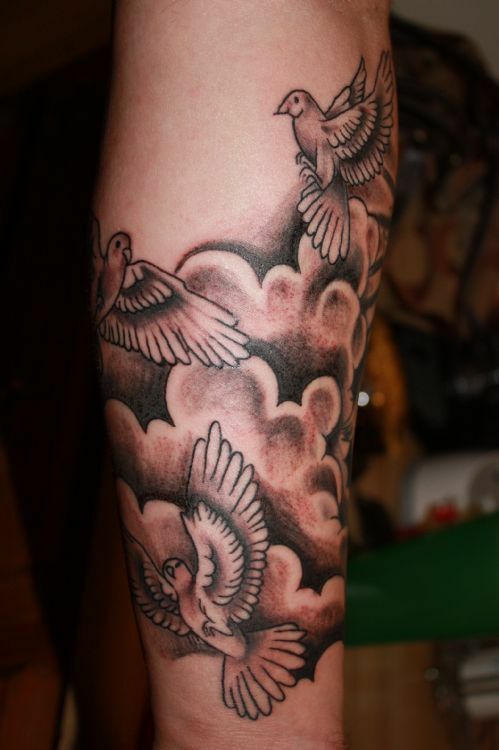 A forearm tattoo of three doves on a cloudy background. 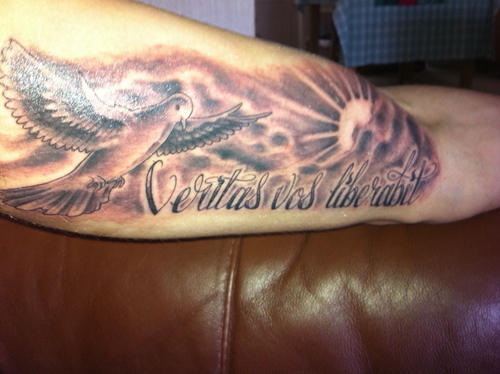 A very detailed tattoo of a heavenly themed design with a dove. 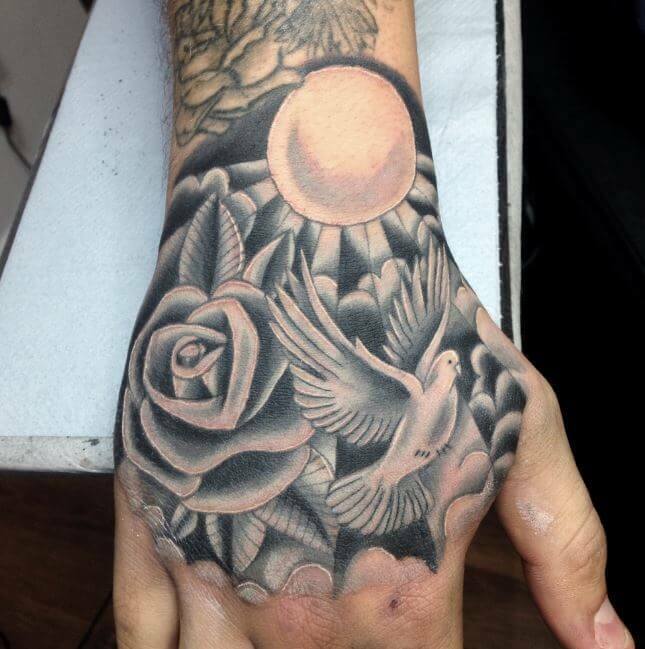 A hand tattoo a dove that is very detailed. 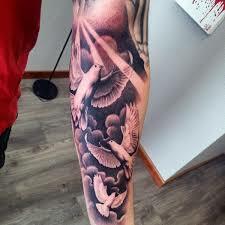 A sleeve tattoo of three doves in a heavenly-themed design. 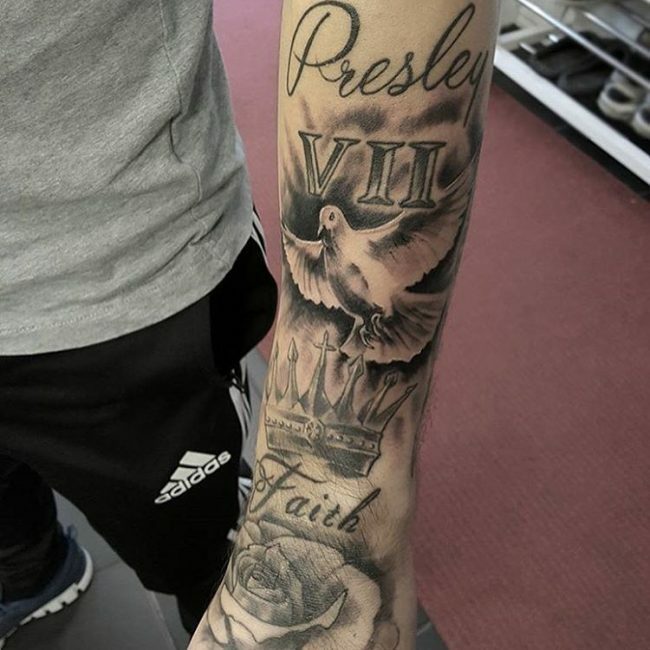 A very detailed sleeve tattoo of a dove and two hands. 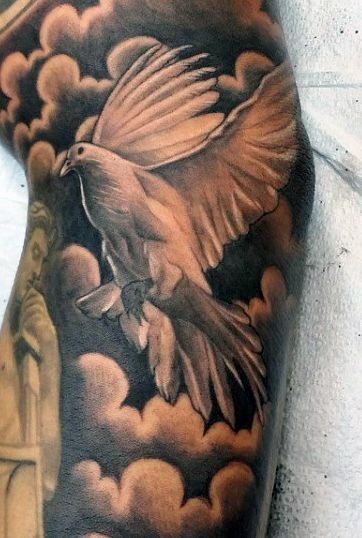 A very detailed cloudy tattoo of a dove. 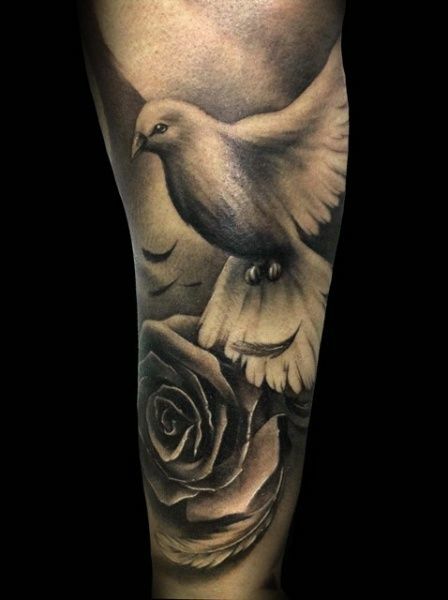 A very realistic tattoo on the leg of a dove and a rose. 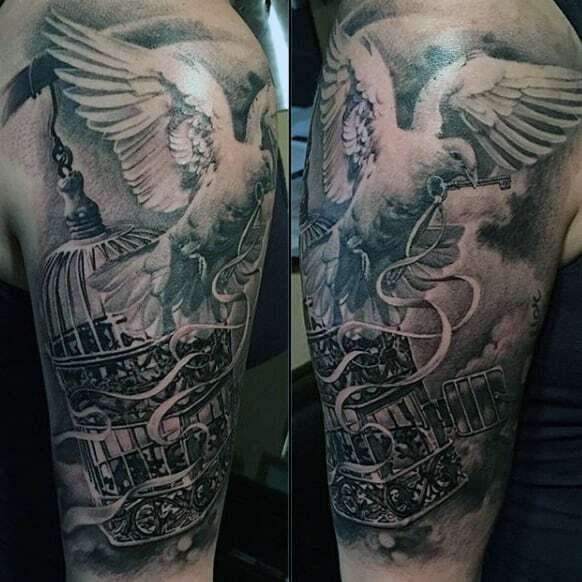 A heavenly themed tattoo with three doves holding a rosary. 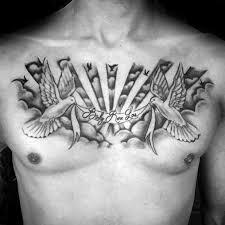 A very detailed chest tattoo of two doves. 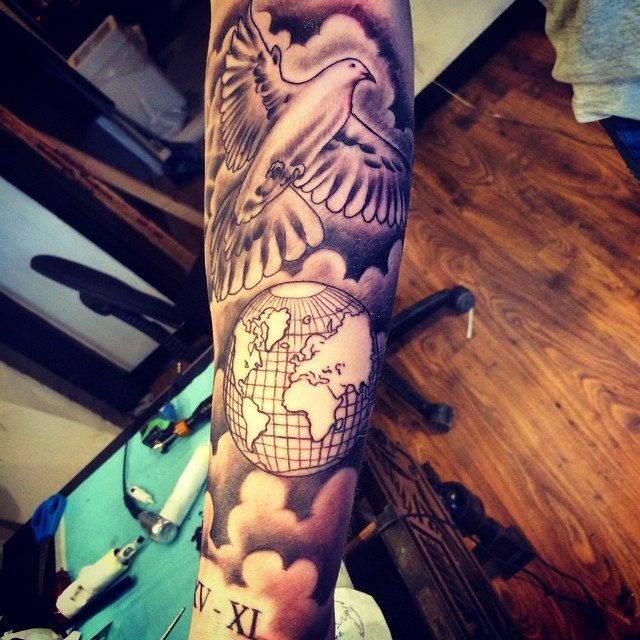 A heavenly themed sleeve tattoo of a dove. 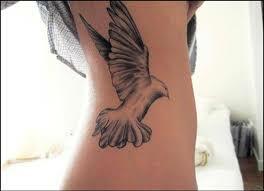 This is another popular take for the dove tattoo design. 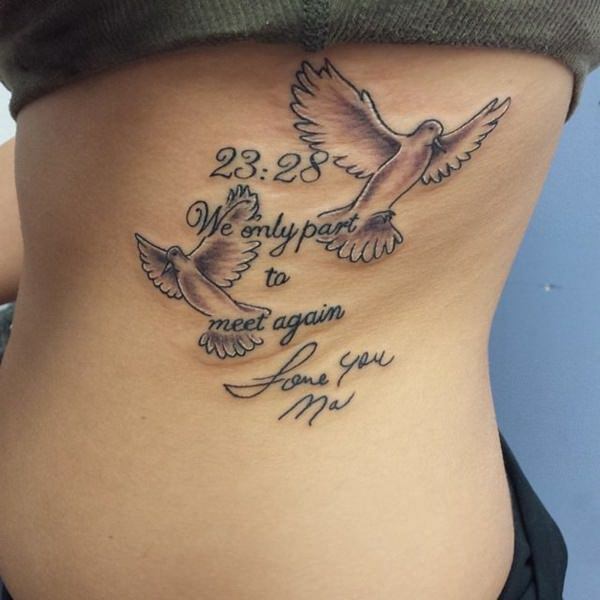 Couples use this design to show their eternal love for one another. This tattoo best represents people who are in love or in some kind of an amorous relationship with another one. 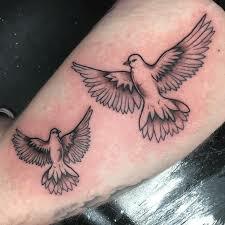 Both doves are flying towards each other, as a symbol of getting together or unity. A beautifully detailed ankle tattoo of two turtle doves. A detailed back tattoo of two turtle doves. 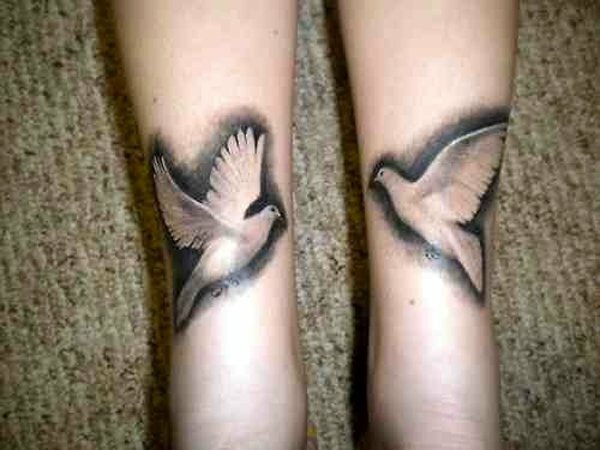 a tattoo of two turtle doves. A small chest tattoo of a turtle dove with a heart. A very detailed back tattoo of two turtle doves. 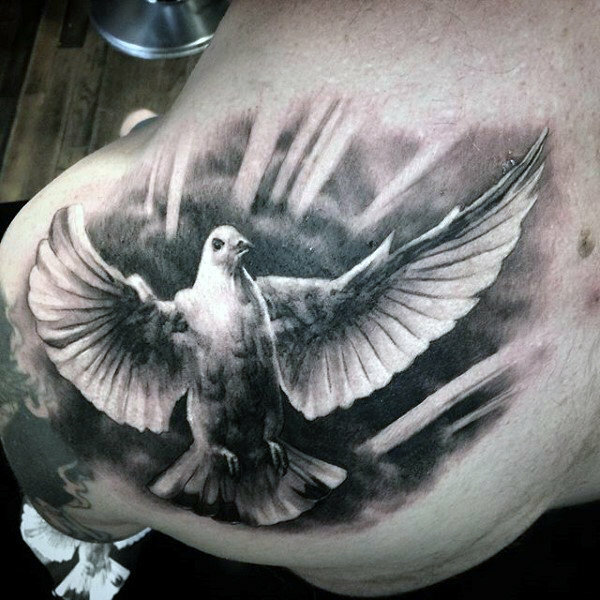 A large simple tattoo of a turtle dove on the back. 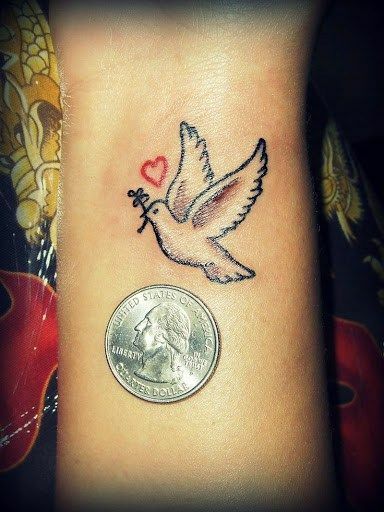 A small simple tattoo of a turtle dove on the wrist. A detailed back tattoo of a turtle dove. A couple tattoo of a turtle dove holding an olive wreath. Like we said earlier, the dove tattoo is considered to be a unisexual tattoo design which is why it is quite common to see dashing men rocking a dove tattoo or any other bird tattoo. 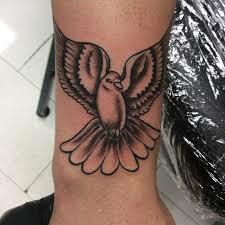 They are full of symbolism and in addition to that, the dove is a very flexible tattoo design element wherein you can have it in different styles from the neotraditional tattoo to the more complex and jaw dropping watercolor tattoo. 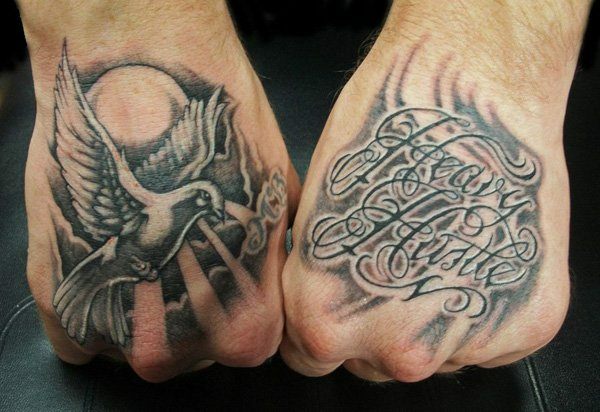 A very detailed hand tattoo of a dove and a rose. A very detailed sleeve tattoo of a dove freeing itself from a cage. 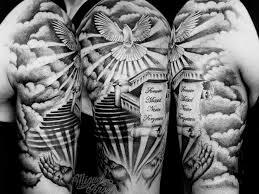 A heavenly sleeve tattoo of a staircase and a dove. A colored neotraditional tattoo holding an olive branch. A large ankle tattoo of a very detailed dove. A small dove tattoo on the back. A heavenly designed tattoo of a dove on the shoulder. 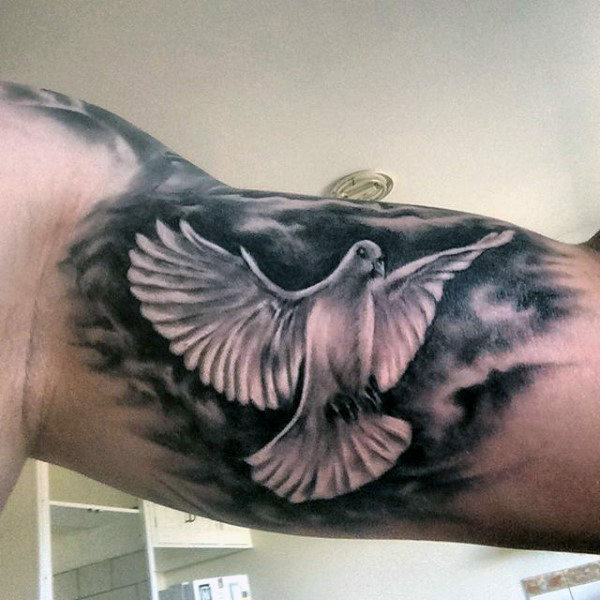 A sleeve tattoo of a realistic dove. 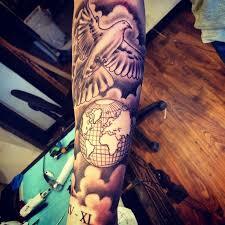 A very detailed forearm tattoo of a dove and globe. 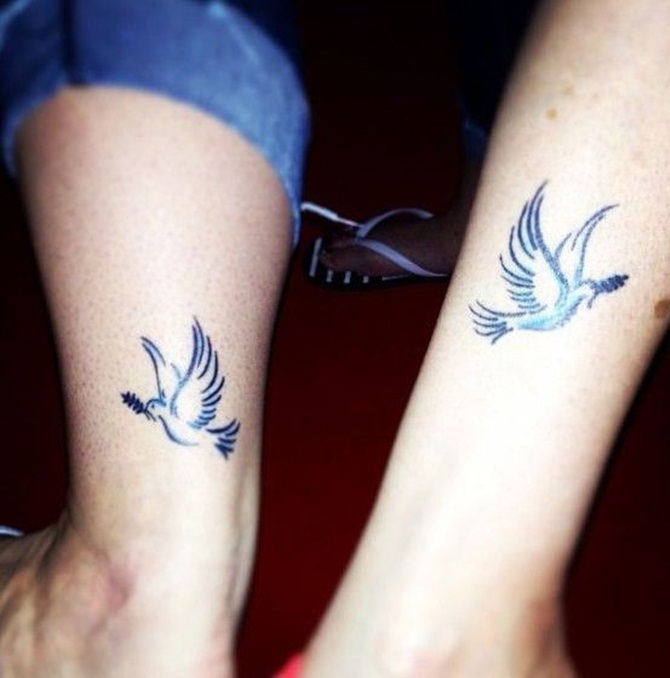 A couple dove tattoo on the ankle. 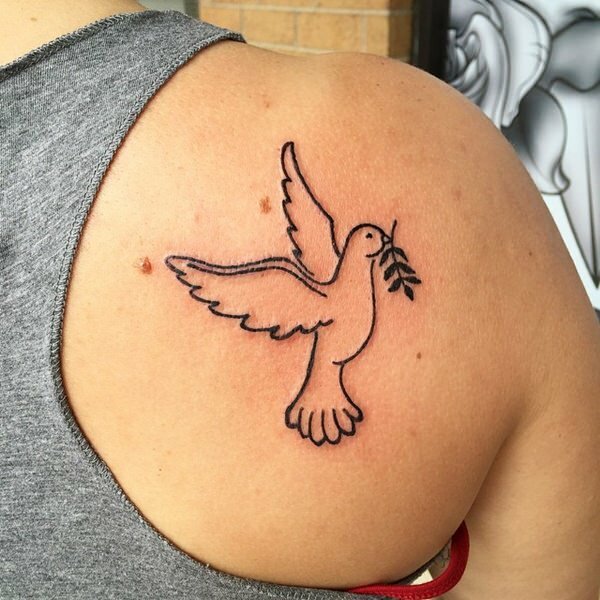 Despite the unisexual appeal of the dove tattoo, you can see more women wear this tattoo design than men since it is considered more of a feminine tattoo than a masculine one. This is very evident on the variety of tattoo designs that are available for women that feature the dove if compared to their male counterparts. This might be a reason why women are more drawn to this tattoo than men because of the options they have for this tattoo. 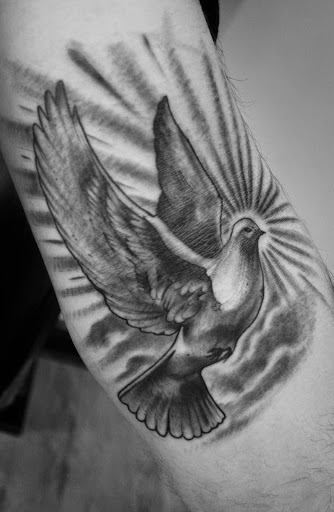 A very detailed non-colored neotraditional tattoo of a dove. 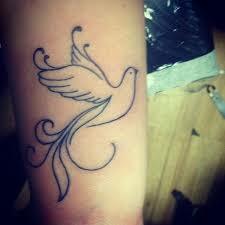 A curvy and simple tattoo of a dove. 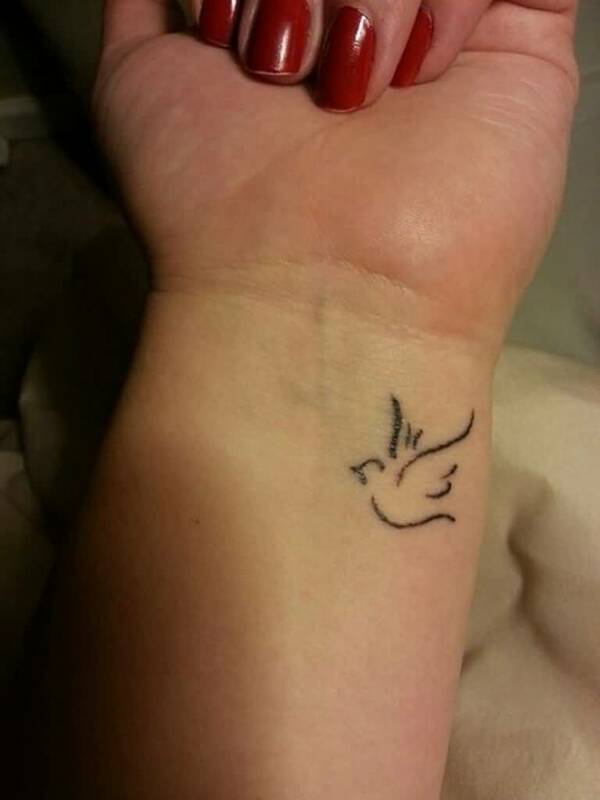 A simple little wrist tattoo of a dove. 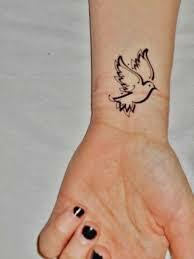 A simple dove tattoo on the wrist with a heart symbol. 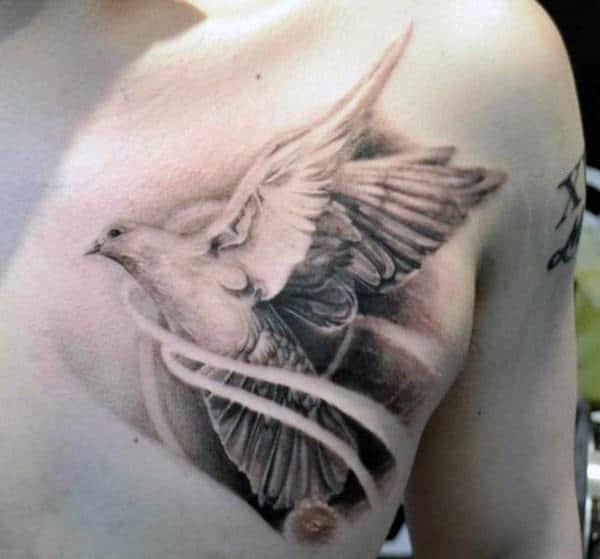 A detailed realistic tattoo of a dove on the rib. 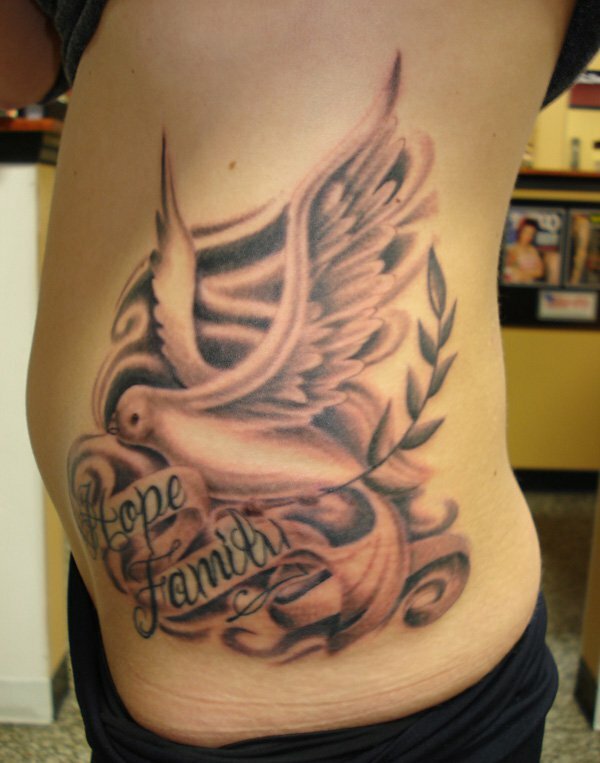 A very detailed rib tattoo of a dove. 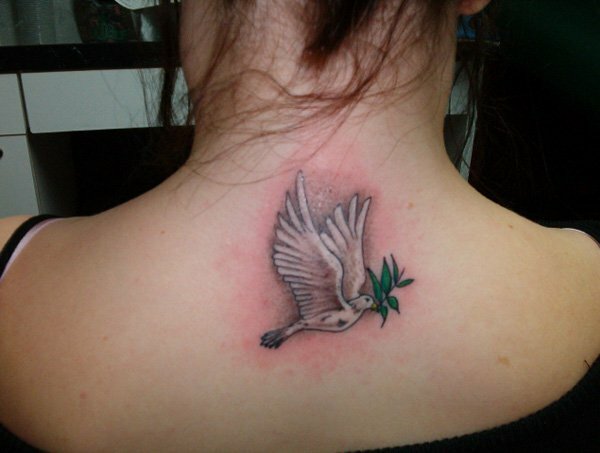 A detailed simple tattoo of a dove holding a leaf. 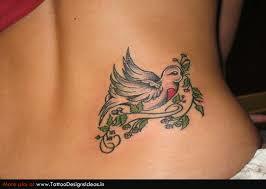 A detailed back tattoo of a dove holding an olive wreath. 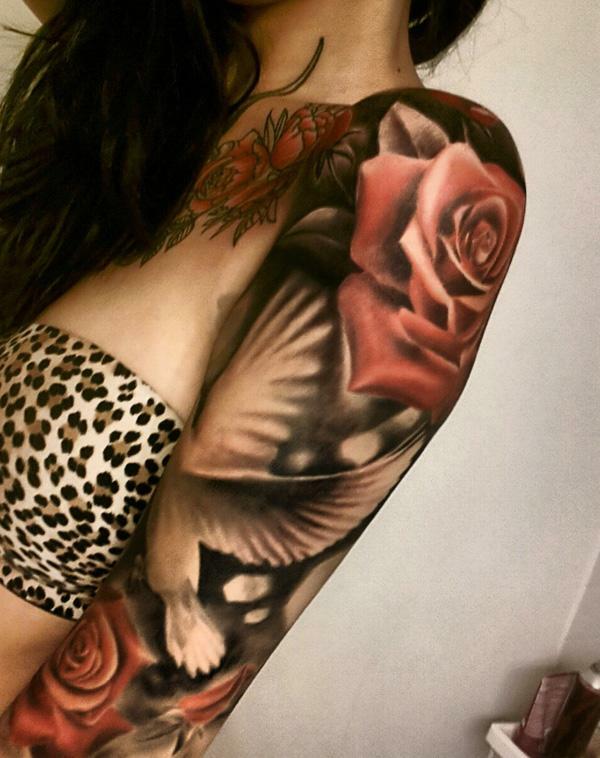 A large and detailed sleeve tattoo of a dove with roses. 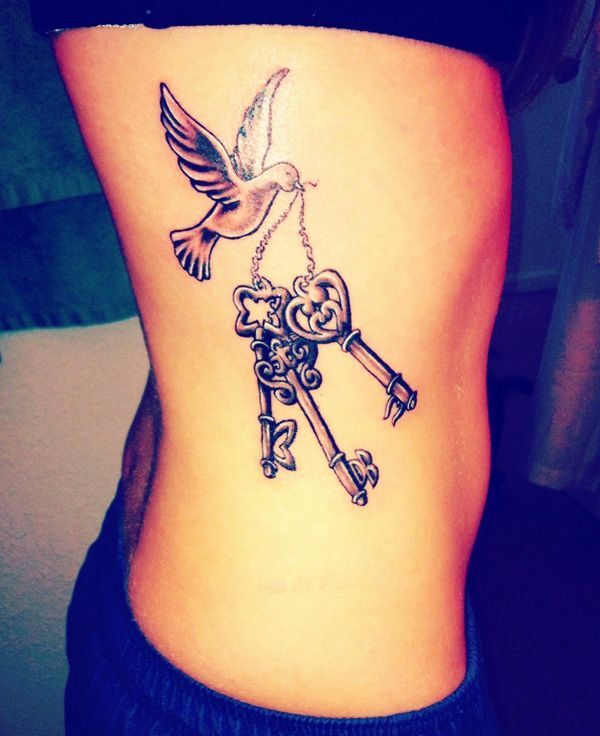 A very detailed dove tattoo holding keys in its mouth. Jason has been an avid fan of tattoos for over 13 years now. He is currently 35 years old, and he got his first tattoo at the age of 22. Since then, he has added over 20 tattoos to his collection. He is also into writing, which is why he decided to celebrate both of his passion and hobby through tats ‘n’ rings. Jason dreams of having his very own tattoo parlor soon. Jason would be very happy to answer any questions about tattoos that you may have! Leave a comment below and he’ll answer it for you right away!